Widden Stud has announced it has secured an exciting new addition to it's roster for 2014 with Group 1 MVRC Cox Plate and VRC Australian Guineas hero Shamus Award to be retired to stud immediately. The best son of outstanding young Redoute’s Choice sire Snitzel, the Danny O’Brien-trained Shamus Award stamped himself as the best three year-old in the country last spring when he led throughout to win Australasia’ WFA Championship, the W.S Cox Plate. In capturing Australia’s premier weight-for-age event, Shamus Award downed seasoned Group 1 stars Happy Trails, Fiorente and Foreteller with recent Group I ATC Queen Elizabeth Stakes winner It’s a Dundeel also among the beaten brigade. Shamus Award returned in the Autumn and created history by becoming the first 3yo to win the sire-making Group 1 VRC Australian Guineas after winning the W.S Cox Plate. 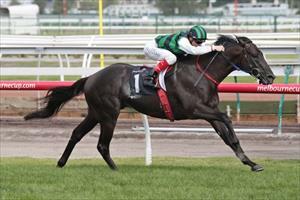 Deservingly, Shamus Award retires to Widden as this season’s Timeform Champion Australian 3yo. "Shamus Award is the first 3yo ever to win the Cox Plate/Australian Guineas double and we are thrilled to have him join our roster alongside our other new addition, the brilliant dual Group I winning sprinter Zoustar who also made history as the first 3yo to win the Gr1 Golden Rose/Coolmore Stud Stakes double,” Thompson said. "To be honest, it feels a little like déjà vu, starting off two young stallions together that we believe are the best sire prospects in the land. A stunning individual, Shamus Award was a $230,000 Inglis Easter Yearling and was the top priced offering in Session II which speaks volumes for his merits as a type. Raced throughout his career by Sean Buckley of Ultra Tune and his long-time friend Viv Oldfield from the Northern Territory, Shamus Award won or placed on 10 occasions from 14 starts with prizemoney of $2,473,500. Part-owner Viv Oldfield has enjoyed the ride of a lifetime with Shamus Award, who joined a very elite list of three year olds when he won the Cox Plate, a list that include the likes of So You Think, Savabeel and Octagonal. "He is a remarkable colt who has taken us on the ride of a lifetime. Danny did a great job with him as a racehorse and I’m sure Widden will do the same as a stallion," Oldfield said. Whilst Danny O’Brien expressed his disappointment at not having the opportunity to attempt back to back wins in the Cox Plate he did say: "I am very proud of what we achieved with this magnificent individual. "He has done what no other 3yo has done before by winning the Australian Guineas after winning the Cox Plate – to lead all the way in both races makes this achievement even more incredible. He has a rare determination you don’t often see and I will be sending mares to him hoping his progeny inherit these traits”. Shamus Award will stand for $27,500 including GST in his first season at stud.